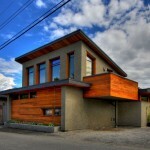 Architect Scott M. Kemp designed this house in Ladner, British Columbia, Canada, as a residence for himself and his family. 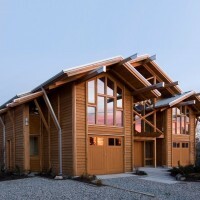 The project looks to find a different way to build single family houses: to rethink conventional wood framing and to develop a sustainable approach to home construction. The house is designed as small as possible but allows for maximum flexibility – including adaptability of use with aging residents and subsequent reduced mobility. 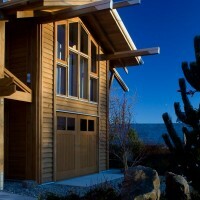 At approximately 2200 ft2, the house is actually smaller than that allowed by the zoning. 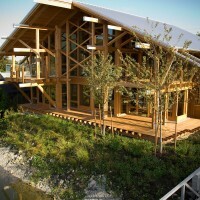 The design incorporates features of sustainability and the house has achieved a LEED PLATINUM rating from the Canadian Green Building Council. 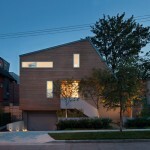 The program is a single family residence for the architect and his family of four. 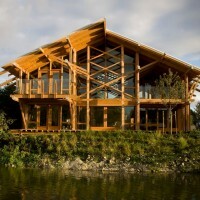 The house is envisioned as a simple shelter – providing protection from the elements while maximizing the connection to the natural environment of the river, by breaking down the barrier of the indoor/outdoor space. Transparency through the building resolves the conflict of maximizing the exposure of views to the north with the desire for maximum sunshine. 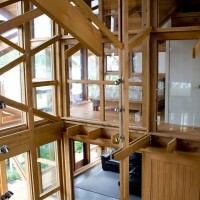 The house has three zones longitudinally. 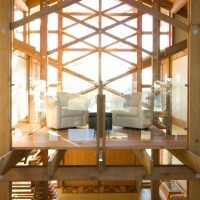 Two side zones are two story elements while the central zone is a large vaulted space. 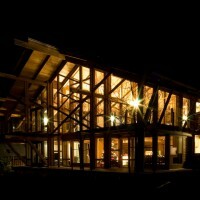 The two side elements are shifted in plan to open up the view of the main rooms to the west setting sun, and to create outdoor space adjacent to the river. 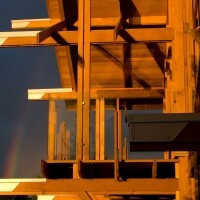 The stepping of the western portion of the building provides shade for the main south facing glazing. 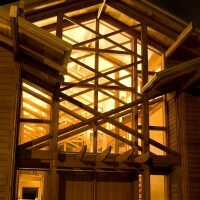 The main entrance is located in the central vaulted space framed on each side by the garage and workshop. 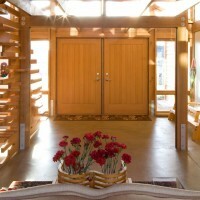 The entrance is part of the ‘grand room’ – kitchen, dining and living room – located on the north side of the building facing the river and the views. An adjacent family room can be separated through the use of a sliding wall thus allowing it to also double as a separate bedroom or as a self contained suite for the client’s elderly mother. Upstairs the master bedroom is facing the river with a large deck cantilevering. A second bedroom looks out over the farmland to the south. 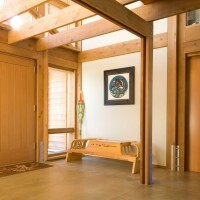 A bridge spans the central void with a sitting area providing views of the river to the north and the farmlands to the south. 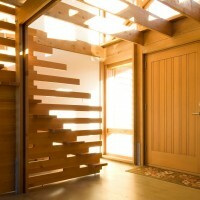 A trellis of wood framing extending from the bridge to the outside defines the entrance area and provides additional protection at the front door. 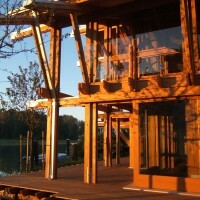 On the opposite side of the building, facing the river is the ‘sunroom’ – a large covered deck orientated to the western setting sun and the mouth of the river. The ‘winter room’ is a solarium type space that is a multi-purpose space that can be used as a home office, additional bedroom or rec-room. 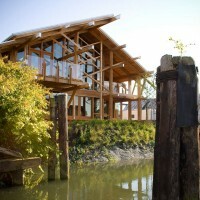 Situated on the south banks of the Fraser River, the site is located in a secondary waterway separated from the main river channel by a series of estuary islands that are designated as a Nature Park accessed solely by water. The islands frame spectacular views of the North Shore Mountains in the distance. Downriver from the village of Ladner, the property is surrounded by a mixture of suburban housing, agricultural farmland and a spectacular natural river setting – a small oasis in the transition zone between the built environment and nature. The site is an extension of the river dyke and downriver, to the west, is the mouth of the river and the Georgia Strait. The site was a brown field site – historically used by the fishing industry with the river providing moorage and the upland property used for net lofts, storage and the maintenance of equipment. The form of the building references the many industrial ‘sheds’ that are scattered along the river, blending the historic industrial typology with a domestic expression. 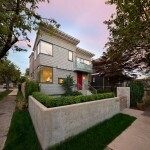 It is close to community amenities, transit and public open spaces. The construction budget was $230.00 per square foot. The property required rezoning and an environmental review by the Port Authority. 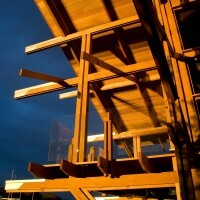 Construction was completed in 11 months and the architect was also the contractor for the project. 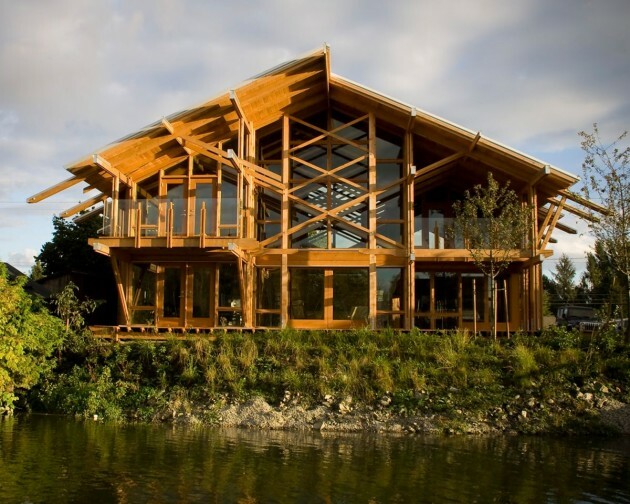 The house is carbon zero; all heating including hot water is through a heat pump utilizing a closed geothermal loop system that has a heat exchange plate hanging in the river below the dock. The house does not include a fireplace and has no connection to gas. Minimal air leakage was obtained through the use of SIP panels and careful detailing. The building form is designed in compliance with solar orientation with 90% of the south glazing shaded at midday on June 21 and exposed on December 21. 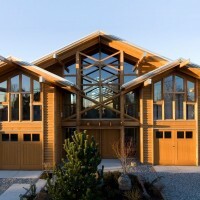 Two types of e-coating were specified for the glass – a hard coat on the south and east facades that allows solar heat gain into the house, and a soft coat on the north and west facades that radiates the heat back into the house. 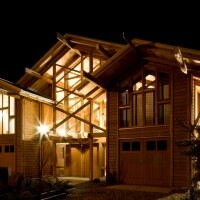 The house is constructed with two building systems: SIP panels (structural insulated panels) and exposed timber framing. 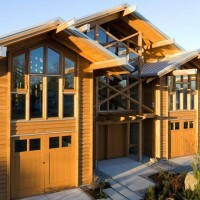 Sip panels make up the southern portion of the house (garage and workshop including the side walls) and the roof. 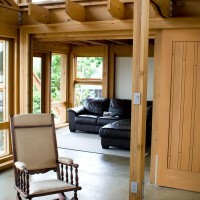 The remaining portion of the house is made up of an exposed timber framing. 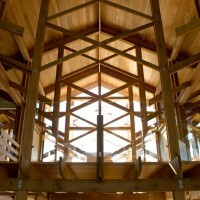 The framing is not, however constructed from large heavy timber sections but conventional dimensioned timbers (2×6, 2×8 and 2×10) intertwined together to create a heavy timber expression. 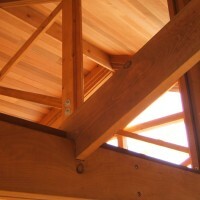 The lattice joints form a truss to provide lateral bracing. No trees were cut to build the house. 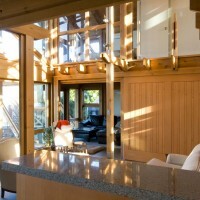 All the timber was milled from salvaged logs harvested from an elk reserve on Vancouver Island. A significant number of trees were blown down during the large winds storm that hit the west coast several years ago. The fallen trees presented a significant fire hazard as well as obstructing the natural migratory routes of the elk. This is the first forest harvesting of its kind on the west coast. 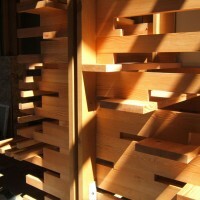 The logs were milled and graded locally and then all components were cut and pre-assembled to ensure an accurate fit. 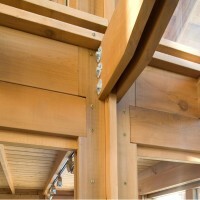 Dimensioned lumber was also used for glazing frames with sealed glazed units installed in-situ. 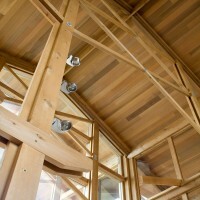 The sealed glazing units are framed directly into the wood members thus minimizing material usage. 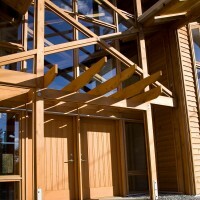 The prefabrication process maximized wood yield and minimized construction waste. The light colored, high-albedo metal roof mitigates local heat island effects and is used for rain water collection for grey water use. Minimal finishes reduce harmful off-gases. The building has a HRV (heat recovery ventilation). The ground floor had an exposed concrete slab with radiant floor heating. The concrete is finished with a water base stain and sealant. Upstairs is hardwood flooring. The small amount of carpet is natural wool with no chemical stains. 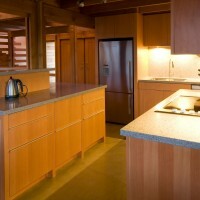 All wood was finished with a natural water base stain. A natural habitat was recreated on the rivers edge with riparian vegetation – native plants which would typically grow on the river bank. The benefits are threefold: 1) the vegetation provides natural cleansing thus improving water quality, 2) the riparian zones provide natural habitat and 3) the plants help stabilize the slope and prevent erosion.